We invite you to experience the ride of a lifetime. The fun begins with the exciting inflation of the balloon, and before you know it, you are soaring with the eagles! Watch the sunrise during your ascent. 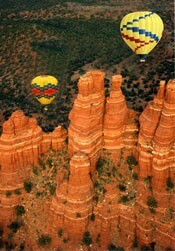 After your gentle lift-off, you will be gliding over the gorgeous Red Rock country of Sedona. The views are simply incredible! It is truly a magical feeling soaring gently with the wind.. experiencing an "Aerial Nature Walk". Your tour lasts 3 to 4 hours, includes a DVD of your adventure plus there is no driving!! You will be picked up and returned to The Lodge at Sedona. Once back, you can enjoy the luxury and hospitality of The Lodge at Sedona. Enjoy our acres of beautifully landscaped estate property, and our on-site meditative labyrinth. Your adventure includes a Balloon Ride for two; three days and two night's accommodation in a luxury King Suite; wholesome breakfast. This package is based on balloon ride availability (and weather permitting) and available King suites. It is not available with other discounts, third party bookings, prior bookings, or holidays. Package includes best available King suites excluding Red Rock Crossing and Mission Grande. Simply call 800-619-4467 and Review RULES Below. • Please Note: For your comfort and safety we have asked and you have confirmed that NO ONE in your party is pregnant, has any physical disabilities, has had any recent injuries or surgeries in the last 12 months (prior to your flight date). In addition, NO ONE in your party needs assistance walking or standing or has any heart or respiratory issues. • Weights: To confirm a reservation we need accurate weights for each individual passenger. Approximate heights may be used but individual weights MUST be ACCURATE. Balloons are loaded based upon system gross weight limits in order to ensure the comfort and safety of passengers. • Children: All passengers must be 48 inches tall to fly. Children are the same price as adults. • 48-Hour Cancellation Policy: Passengers agree to the Balloon companies 48-Hour Cancellation Policy, which states that you may NOT change or cancel your reservation (for any reason including illness) within the 48 hour period preceding the morning of your flight date. If you are late for your pickup (for any reason) and we have to leave without you the Balloon Company will charge your credit card fully, as you are within the 48-Hour period. The balloon MUST launch at sunrise! We cannot call the sun and ask it to wait for us because we are running a little late!